A scaled claim based on the date of commercial availability of a CPU microprocessor with a clock speed of 10.0 GHz or higher. 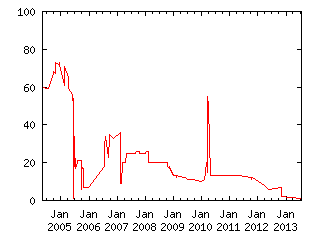 The claim value is based on the month of commercial availability, beginning with a value of 1.00 for January 2005, and declining by 0.01 per month. If a 10.0 GHz processor becomes available before January 2005, the payoff will be 1.00. If a 10.0 GHz processor does not become available until after April 30, 2013, the payoff will be 0.00. A chart showing actual payoff values for each month is shown at the bottom of this description. I will judge this claim based on the commerical availability of the first 10 GHz or greater microprocessor released by *any* chip manufacturer.